KATHMANDU — Business as usual is over in Kathmandu. With two days to go until May First, overflowing buses are pulling in by the hour to the outskirts of town. The city is crowded. Bus caravans are unloading directly into street marches wild with chanting, marshaled by uniformed cadre from the Young Communist League. Despite a week of fear-mongering by Nepal’s mainstream press, the crowds are militant, but unarmed. And they are giddy despite harassment from the Armed Police on the roads leading into the city. Several Maoists have been arrested on petty weapons charges, but these are the exceptions to the rule. The Maoist rallies have already started. The central intersections of every district I passed were filled with young people, always the young! There is more density towards the center of the city, as mini-rallies are moving from the outskirts towards the center, but they aren’t all staying by government buildings. It seems as the contingents arrive, they are dipping into the center and then marching back out across the city. The convergence of all these hundreds of thousands of people is set for May First. The contingents are on their own for now. Every Armed Police cop in the city must be on alert. They are rallying too, but look noticeably unhappy. Not aggressive so much as slouching in the back of their trucks, looking around nervously. Among the residents of Kathmandu, the people going about their business while the city fills up, facial expressions are as good a guide to allegiance as anything people say. Those who believe that people should make governments are excited, mobilized and on the march. Those who fear the country people, the young and the workers are dour, hurrying to reach their personal destination. I met Mukti, a Maoist party district leader from Kathmandu while he was overseeing rows of single-file columns, mostly students, filing out to their housing in the late afternoon. Rain clouds were looming. With a rare full beard and long hair, his tone was scholarly with a hint of rocker, and a Pearl Jam button his bag. “The youth are going to make this day,” he said pointing to the three single-file lines of young men stretching parallel from the bus station a kilometer away. None were children, but all were too young for marriage – mostly older teenagers. And you can. When the amped up chanting came to a quiet, I saw the beautiful stoicism of young men facing danger for a cause they feel is just. Since his English was good, I decided to try and provoke him a bit. I mentioned that the current prime minister’s party had fought for democracy in 1990, only to become politicians more keen to manage the country that reform it. I asked if he was worried that the Maoist leaders might only be interested in becoming government ministers like the UML and Congress parties. Mukti smiled, and launched right into response. He stretched out his arms to frame the hundreds of students all around us. I could not help embracing him. The twenty or so guys who had formed a circle around us as we talked all burst into laughter and hurrahs. He told me army helicopters had been flying low all day, with soldiers brandishing assault rifles hanging from the chopper doors. And he was off, filing in at the end of the lines winding off down a small curving road from the intersection. Passing back through the trolley yards I’d visited a few days ago to check in on the union office, Armed Police were at the gates, in repair barns and the yard — dozens of them loitering about their trucks. The union office was closed, but Maoist posters for May First still covered the walls. I stopped into the charging station to ask one of the workers still on shift what had happened. He looked back over my shoulder at the Armed Police commander starting at us from within earshot as we talked. Deciding against that, I moved through the yards to see what was going on. Most of the workers had left the installation. A plainclothesman also came to look at what I was doing when I started taking pictures. I asked if he was Armed Police. “No, I am democratic police,” he said, meaning that he was connected with the municipal police who are under a different command structure and don’t enter into civil conflict. Lines of drying black, gray and white camouflage fatigues were hanging out to dry. Armed Police have occupied the transportation yards, converting them into a make-shift barracks. Most of the workers were no longer there. For all the fear-mongering about Maoists armed with lathi bamboo sticks and kukhuri knives, the Armed Police were brandishing automatic weapons and military rifles. And nobody voted for them. Armed Police also rousted rural Maoists from several private schools. Apparently the Maoists are not picking fights before May First, and have left some locations. Police encampments at several schools have kept protestors from entering, others are full and have stood their ground. Traveling further to the city’s east, the roads were lined with apparent Maoist cadre and protesters. They did all have signs, but were in the same long, stretching lines on both sides of the street that is the signature formation of the assembling contingents. There were at least a thousand here so I stopped and asked out loudly if anyone spoke English. I didn’t even have to ask Pawan question, he had some things to say. Maoist party leaders are not calling this a “People’s War.” For his part, this rank-and-file cadre saw this as the final battle in the fight over power in Nepal. “Maoists are the largest party. People, we support the Maoist. Most people are supporting Maoist. This government abuses people and does not make the change we want. Our busses were stopped. YCL is taking care and we show we come with people not weapons. We are careful in our fight. We pressure to change government like Thailand,” he said referring to the Red Shirts laying peaceful siege to Bangkok’s business elite. The reserved style of Nepali conversation is turning to agitation. As that is more my own style, I told him that in the USA we have a constitution, a federal government and all that – but it is a capitalist constitution based on money and property. How was this different? What makes this socialist? Jed Brandt is an American reporter writing from Nepal. His reports and photographs appear on jedbrandt.net. He is a participant of the Kasama Project. Read other articles by Jed. 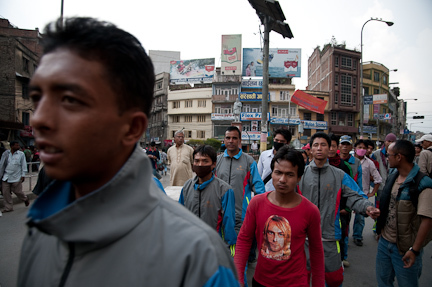 This article was posted on Friday, April 30th, 2010 at 9:01am and is filed under Activism, Nepal, Police, Socialism.